I’ve been working as a trainee across the External Relations department at National Museums Scotland since September 2018. It’s been amazing to be a part of several teams working at the National Museum of Scotland, which covers almost every subject imaginable. Despite this, over the past six months, almost everyone I’ve been working with has been focussing on the same project, the new Exploring East Asia, Ancient Egypt Rediscovered and Art of Ceramics galleries. 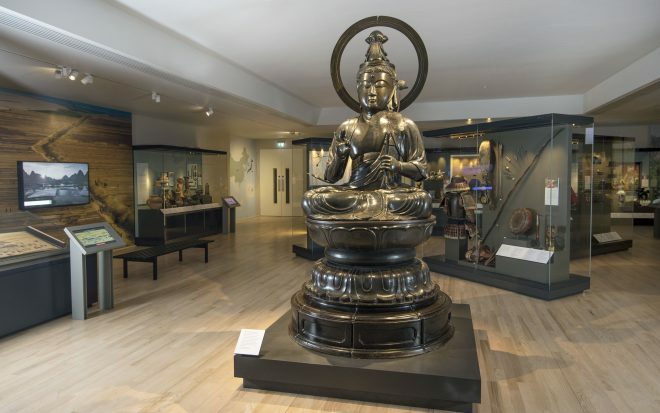 These galleries complete a 15-year transformation of the museum, so it was very exciting when the time finally came for them to be opened to the public in February. The completed Ancient Egypt Rediscovered gallery. Image Neil Hanna Photography. Back in September, one of my first tasks for the new galleries was working on the public fundraising campaign, raising the money to open them. We worked on some social media for the public campaign that would encourage people to consider donating to help us open the galleries. Once the campaign started I then began processing donations, along with colleagues. It was an exciting day in the Development office months later when the fundraising target was reached and the campaign was finally closed! Throughout the next few months, I got to see many different aspects of the work that went into the galleries, from choosing the best voice actors for the animations on the interactive screens to listing the right times online for Chinese lion dance performances. I found out about what people from all over the organisation were working on when I edited and uploaded posts to the blog like this one about conserving the Qurna coffin, and learnt more about the objects in the galleries when creating Pinterest boards all about them. I also worked on some of the marketing for our Chinese New Year activities, like the aforementioned lion dance performances, which tied in perfectly with the opening of the Exploring East Asia gallery. I got a chance to look around the new galleries in the week before they opened as everyone geared up for the opening week. I had a really good look around when assisting with an afternoon of photography and videography in the galleries – someone had to fill the background of a few shots, looking at all the objects and reading the information panels! Something often mentioned in External Relations teams is surprise at the real size of objects once we see them in the gallery. After working with images and descriptions of the objects for so long, we usually won’t see the real things until they’re in place ready to be displayed to the public, so it’s often surprising to see the scale of them. I found this particularly interesting with the coffins of children in the ancient Egypt gallery, like the double coffin for two boys pictured below. The inside of this coffin shows a representation of the sky goddess Nut for each boy, while the lid of another coffin depicts the child as an adult, making it more surprising and sobering to see how small the coffins really are. 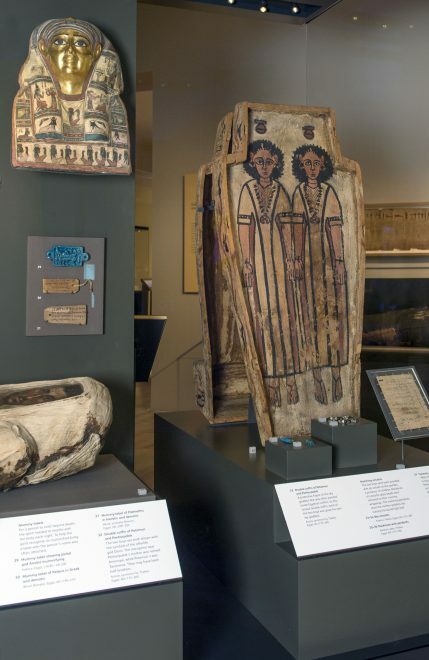 Double coffin for two boys on display in the Ancient Egypt Rediscovered gallery. Image Neil Hanna Photography. Some of my favourite objects in the new galleries are the beautiful netsuke, small carved ornaments, usually made of ivory or wood, worn as part of Japanese traditional dress as a toggle by which a container may be attached to the sash of a kimono, as they didn’t have pockets. I particularly like the display of the 12 East Asian calendrical animals included within the gallery display of netsuke! 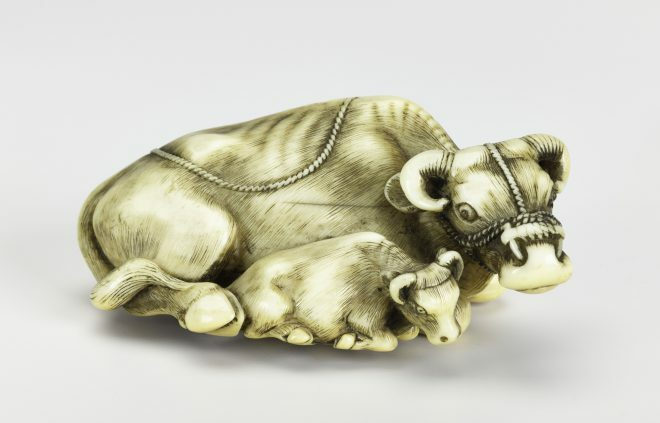 I was born in the Year of the Ox, represented in the gallery display by this ox netsuke. Opening week was super busy as I helped out with some of the many events organised to celebrate the opening with different groups of people, many of whom had helped with the galleries along the way, as well as with the early viewings of the new galleries for press and broadcasters, so that they could spread the word about them. It was good to hear what everyone thought of the new galleries at events and then to see so many visitors of all ages and from all over the world enjoying them once they opened. 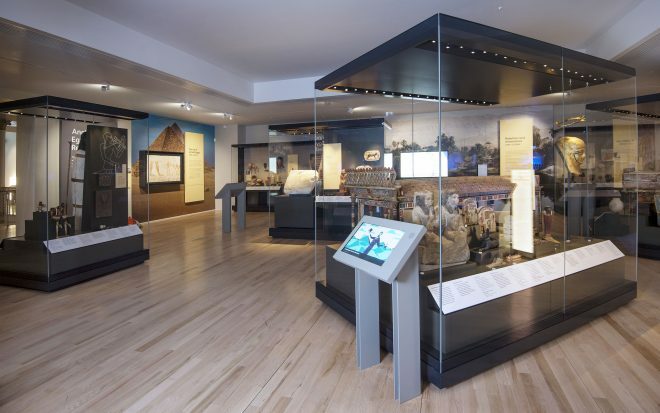 It’s been great to see this project develop over the past few months and the galleries so busy, I’m now looking forward to working with the National and International Partnerships team on the Ancient Egypt and East Asia National Programme, which is bringing stories from the new galleries to museums across Scotland.